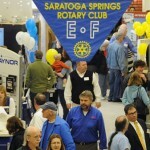 A variety of businesses will exhibit on the main floor of the Saratoga Home & Lifestyle Show, including categories such as home improvement, landscaping, décor and fine finishes, heating and plumbing, pools, financial and professional services, and many more. FREE ADMISSION for all ages, courtesy of the show’s major sponsor, Adirondack Trust Company. To see an exhibitor list as of February 22 and the booth locations, click here. Additional exhibitors have since been added and some locations may have changed. Mac ‘n Cheese Bake-off (Saturday 11:00 a.m. to 3:00 p.m.) with free samples from area restaurants. Vote for your favorite! There are many on-street spaces and parking lots near the Saratoga Springs City Center. Check out this parking map by the Saratoga County Chamber of Commerce. Several garages are just a short walk from the City Center, a few blocks off Broadway. There is also parking all along High Rock Avenue, on the other side of the parking lots near the City Center. 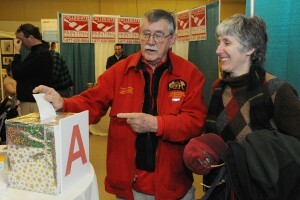 The show features hourly door prizes and a grand prize. When you enter the show, you’ll receive a strip of three tickets. Fill them out with your contact information and then place them in the prize entry boxes at various points on the show floor. If your name is drawn for a door prize, we will contact you by phone. The Rotary Club thanks our generous sponsors for their support. We are fortunate to receive their contributions. We encourage you to patronize their businesses!